In this article you’ll find brief reviews, screenshots and download locations for 10 different Windows application launchers. If you can’t find one you like in this list, I’ve also included links to 5 6 (thanks Vince!) more at the very bottom. Dash Command was probably the worst of the keystroke based application launchers that I’ve used. Here are my two biggest complaints – 1) It’s on “sale” for $19.95, which is the price for the “pre-release” version. It’s going to cost $50.00 after it leaves the pre-release stage. 2) It was very, very unstable in Vista (see the last screenshot below). Dash Command works on Win 2000, XP or Vista, and didn’t use too many resources (about 14MB, until it crashed – then it sky-rocketed to 200MB before I killed it). There is a trial version but it’s feature-limited to: only 5 user custom commands, limited web commands, no zip or email commands and you can only use the built in scanners. I couldn’t get the Music feature to work at all, but that may have been a limitation of the trial version (?). For the full list of features, see this page. My suggestion? Skip it. There are too many better application launchers with the same (or more) features, for much less money (free). Find And Run Robot (FARR) may not have the slick look (by default) of some of the other keystroke based application launchers, but it certainly doesn’t lack in features. And if there’s a feature not included by default, you can probably find an addon to include the missing functionality. FARR had a very small memory footprint in Vista – about 7MB. It indexes your files, bookmarks, folders, pictures and of course, applications. If you’re still using an older version of Windows you’re in luck – FARR works on Windows 9x, 2000, XP and Vista. A detailed (and always up to date) feature list for FARR can be found here. Like most of the DonationCoder.com software, FARR actually includes a list of its “competitors” in the help file, which isn’t something you see a lot of software packages include. Launchy is an open source keystroke based application launcher. It was designed to work on Windows XP, but there’s a .dll file available to get it to work (probably) in Windows 2000. It also worked perfectly in Vista (from my experience). Launchy is probably the most popular of the Windows keystroke based application launchers, and for good reason. It’s stable, uses minimal system resources (about 10MB in Vista) and has an extensive list of features (for the full list see the Launchy Readme file). There are also a number of very useful Launchy plugins for extra features, and skins if you don’t love the default look. nDroid is another keyboard based application launcher. To be perfectly honest, it wasn’t my favorite. There are a bunch of plugins that extend basic functionality, but several caused frequent crashes. Actually it crashed a number of times with the default installation too. Unlike some of the other application launchers, it also indexes your desktop, documents and favorite websites (though most do index bookmarks/favorite websites). One rather unique feature is that it can replace your Start Menu ‘Run’ option, though if you’re using Vista, you might be better off with Start++ to enhance the Run menu. One big positive is that it uses very little memory, and can even be set to “Not-Always-Running” mode, which means it’s launched by the hotkey combo, and exits right after launching an app. 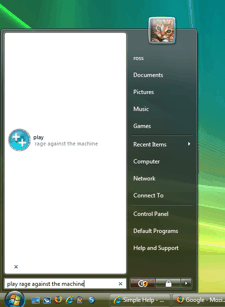 SlickRun is a keystroke based application launcher. It resides just above the clock in your system tray (by default) and since it display the time and date when not being used, you can remove the time from your system tray to recover some space. Type help into SlickRun and you’re taken to the online help files, which are actually quite helpful. One of the neat features included in SlickRun is SlickJot – a place to store brief notes. You can add text to SlickJot by highlighting it and dragging it to the SlickRun window. You can also search through the clips using the built in find tool. Notes are automatically saved. SlickRun has a very small memory footprint – only about 5MB at any given time. To add additional functionality to SlickRun you can install MagicWord Packs (found on the homepage in the MagicWord Packs section). Speed Launch is Microsoft Office Labs recent entry into the application launcher uh contest. Rather than index all of your apps, it requires that you drag the app (or a shortcut to it) to a small circle that floats on your desktop. From there, you give it a name, and from then on you can launch it using that name. It requires the .Net Framework 3.0 (surprise surprise), but it’s not a half-bad app launcher. The MegaSearch feature actually includes search results from 3 search engines – not just Microsofts (Yahoo and Google are included by default). Start++ is a Start menu addon for Vista. It extends the Run box and the command-line with customizable commands. Some of its features include: viewing Wikipedia entries, launching/playing music files, and running programs with elevated (administrative) privileges. There are a number of plugins available for Start++, though I was unable to get the Twitter plugin to work (uses PocketTweets). All in all, this is a pretty neat addon for the Vista start menu. If you use the Vista Start Menu as your application launcher, you may want to take a look at Start++. monitor drive sizes and operating system up-time. You can create multiple boxes and customize each one to your liking. It can also be used on portable USB drives and even on read-only media such as CD-ROMs. True Launch Bar isn’t a keystroke based application launcher, rather, it’s a replacement for the Windows Quick Launch Toolbar. Think of it as the Quick Launch Toolbar on steroids. Though it isn’t free, there is a 30 day fully functional demo (though it has some annoying nag messages). Setting it up takes a bit of work – there are a lot of options and settings, and if you try to use the settings page to create new menus, it can be a bit confusing. There’s a great Flash demo that explains how to use the “wizard” (and provides a good overview of the app). True Launch Bar works with Windows 9x/ME/2000/NT4/XP/Vista. Not really much to say about the Vista Start Menu. Since the introduction of Instant Search, not only does it index the vast majority of files on your PC (depending on your specific setup) – it’s an application launcher in and of itself. As usual, the How-To Geek has you covered with excellent tips on speeding up or disabling Windows Search indexing in Vista and speeding up the Vista Start Menu Search by limiting results. I think the Dash review is very biased. I have tried all the launchers and Dash is probably the best. The problem with the review is that is was based on an old trial version which is not fully compatible with Vista and had many limitations compared to the retail version. I don’t have any relation to the Dash product or the company that makes it but I feel it is not a fair assessment. In my own tests Dash is the fastest, smallest and more feature rich of the bunch, it supports plugins too, plus their customer support is outstanding. I will contact the Dash people to see if they would be interested in providing you with an updated version for review. The reviews for the rest of the apps seem right on. Jason’s comment is spot-on, I also feel Dash has been slightly misrepresented. It’s unfortunate that the trial version is old and Vista-incompatible, but newer builds of the work wonderfully with Vista. Dash does all sorts of cool things the others don’t, like inline calculations (my favorite feature), quick definitions, and translations. For me, Dash was worth every penny. Enso Launcher is now freeware. DOMercury is another neat Application launcher. Similar to much hyped QucikSilver on Mac, DOMercury has 3-panes. User can do a lot more than just launch the programs. It is customizable, the developer is very responsive. Ladron said it already: Enso launcher is now freeware and in my opinion it should show up in this contest, too. My crunch issue with program launchers is one the reviewer didn’t even mention: directory and file format building. I gave up on Launchy because it demands one do it manually, a royal PITA [Pain In…]. Does anybody know if any of these Launchy competitors auto-index ones hard drives for directories [and, less importantly, file types]? My little contribution of free application launcher, feel free to try 8start Launcher, it is skinable! SuperLauncher should be mentioned. SuperLauncher launches applications with hotkeys or one click of the mouse but the twist about it is that you add new shortcuts by drag and drop. You simlpy drag and drop applications, websites, files, or folders, and wizards guide you through adding hotkeys or one-click shortcuts. I use it and I totally recommend it. I’ve used it for years. The developer is also still currently supporting the product. I love Find and Run robot, it’s handy and can quickly launch your application. These are definitely some goods ones. A new one coming out that will blow them away with functionality and customization is Clickey-Split. Check it out at clicketysplit.com It combines the best of all of these plus more features and the best part is it PAYS YOU to use and share it. It makes your life easier AND pays you? Awesome program. Beta starts for it in a couple weeks so sign-up if it sounds appealing. I think RocketDock is a worthy application launcher. If you ignore the “techy” twiddly bits, and want a launcher for simple souls (like me) – what’s wrong with Lauchmate, which has managed to survive several attempts to replace it on my PC. anyway “mouse extender” application launcher is the best one! The fastes way to launch applications is a keystroke. This is implemented in windows itself. If you have applications with the same letter, then you need two letters. For that I recommend slickrun, because you can make your own “magicWords” that can be just one letter. Thats fast!